WARNING: Mycophenolate decreases the body's ability to protect against illness and infection, and may also increase your risk of developing lymph node tumors (lymphoma) and other types of tumors. Therefore, this medication must only be given under close medical supervision. Discuss the risks of taking mycophenolate with your doctor. Notify your doctor immediately if you develop signs of infection (such as persistent sore throat or fever) or other symptoms such as weight loss, night sweats, enlarged lymph nodes, or skin growths. Women of childbearing age must use reliable forms of birth control when using mycophenolate, since it may harm an unborn baby. (See also Precautions). USES: Mycophenolate is used in combination with other medications to keep your body from attacking and rejecting your transplanted organ (e.g., kidney, liver, heart). It belongs to a class of medications called immunosuppressants. This medication works by lowering your body's immune system activity. HOW TO USE: Read the Medication Guide provided by your pharmacist before you start taking mycophenolate and each time you get a refill. If you have any questions, consult your doctor or pharmacist. Take this medication as directed, usually twice daily on an empty stomach, one hour before or two hours after meals. Swallow this medication whole. Do not crush or chew. If you are taking the capsules, do not open them before swallowing. Certain drugs may decrease the amount of mycophenolate that your body absorbs if taken at the same time. Do not take this medication at the same time as antacids containing aluminum and/or magnesium, cholestyramine, colestipol, or calcium-free phosphate binders (e.g., aluminum products, lanthanum, sevelamer). For more details, ask your pharmacist. Use this medication regularly in order to get the most benefit from it. Remember to use it at the same times each day. Dosage is based on your medical condition and response to therapy. Take this medication exactly as prescribed by your doctor. Do not skip any doses. It is very important to continue taking this medication even if you feel well. Do not stop taking mycophenolate without first talking to your doctor. SIDE EFFECTS: See also Warnings section. Constipation, nausea, headache, diarrhea, vomiting, stomach upset, loss of appetite, gas, tremor, or trouble sleeping may occur. If any of these effects persist or worsen, notify your doctor or pharmacist promptly. Remember that your doctor has prescribed this medication because he or she has judged that the benefit to you is greater than the risk of side effects. Many people using this medication do not have serious side effects. Because this medication weakens your immune system, you are more likely to develop infections which may be serious. Tell your doctor immediately if you develop any of the following signs of infection: persistent sore throat/fever, night sweats, flu-like symptoms, painful urination, vision changes, a sore or wound on the skin that feels warm/tender/painful and appears reddened. This drug increases the risk of a rare and possibly fatal brain infection (PML - progressive multifocal leukoencephalopathy). Tell your doctor right away if you have any of these symptoms: clumsiness, sudden change in your thinking (such as confusion, difficulty concentrating), difficulty moving muscles, seizure, difficulty speaking. Tell your doctor immediately if any of these unlikely but serious side effects occur: unusual tiredness, fast/irregular heartbeat, muscle weakness, easy bleeding/bruising, swelling of the feet or ankles, mental/mood changes, weakness on one side of the body, unusual change in the amount of urine. Seek immediate medical attention if any of these rare but very serious side effects occur: chest pain, stomach/abdominal pain, black/tarry stools, vomit that looks like coffee grounds, shortness of breath/rapid breathing. A very serious allergic reaction to this drug is unlikely, but seek immediate medical attention if it occurs. Symptoms of a serious allergic reaction may include: rash, itching/swelling (especially of the face/tongue/throat), severe dizziness, trouble breathing. This is not a complete list of possible side effects. If you notice other effects not listed above, contact your doctor or pharmacist. In the US - Call your doctor for medical advice about side effects. You may report side effects to FDA at 1-800-FDA-1088. In Canada - Call your doctor for medical advice about side effects. You may report side effects to Health Canada at 1-866-234-2345. 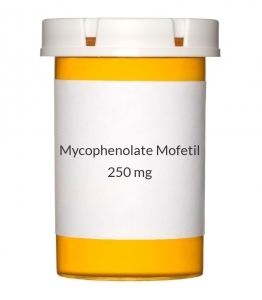 PRECAUTIONS: Before taking mycophenolate mofetil, tell your doctor or pharmacist if you are allergic to it; or to mycophenolic acid, or mycophenolate sodium; or if you have any other allergies. This product may contain inactive ingredients, which can cause allergic reactions or other problems. Talk to your pharmacist for more details. Before using this medication, tell your doctor or pharmacist your medical history, especially of: any type of cancer, kidney disease, liver disease, stomach/intestinal problems (e.g., ulcers), rare genetic disorders (e.g., Lesch-Nyhan or Kelley-Seegmiller syndromes). If you had a kidney transplant and the new kidney does not work properly even though you are taking this medication, the amount of mycophenolate in your body may increase, which can result in increased side effects. Mycophenolate may cause swelling and growth of the gums (gingival hyperplasia). Brush and floss your teeth daily, and see your dentist regularly. Because this medication may increase your risk of developing skin cancers, it is best to avoid prolonged sun exposure, tanning booths and sunlamps while you are using this medication. Use a sunscreen and wear protective clothing when outdoors. Do not have immunizations/vaccinations without the consent of your doctor and avoid contact with people who have recently received oral polio vaccine. Avoid contact with people who have the flu or any other infection. Notify your doctor if you are scheduled for any kind of test or surgery involving your colon (e.g., colonoscopy, abdominal surgery) that requires cleaning out your colon before the procedure. Removing the bacteria in your digestive tract can decrease the amount of mycophenolate in your body. Caution is advised when using this drug in the elderly because they are less able to remove this drug from their bodies, and therefore may be more sensitive to its effects. This medication is not recommended for use during pregnancy. It may harm an unborn baby. If you become pregnant or think you may be pregnant, tell your doctor immediately. Women of childbearing age should talk to their doctor(s) about the benefits and risks (such as miscarriage). Women of childbearing age should have a pregnancy test before starting this medication, after 8-10 days on treatment, and during routine follow-up visits. Also, use reliable forms of birth control during treatment, and continue for at least 6 weeks after mycophenolate is stopped. Consult your doctor for more details. It is not known whether this drug passes into breast milk, but it may have undesirable effects on a nursing infant. Therefore, breast-feeding is not recommended while using this drug and for 6 weeks after stopping mycophenolate. If you must take the drug while you are producing milk, but wish to resume breast-feeding six weeks after treatment is finished, pump your breast milk and discard. Consult your doctor for more details. DRUG INTERACTIONS: See also How to Use section. Drug interactions may change how your medications work or increase your risk for serious side effects. This document does not contain all possible drug interactions. Keep a list of all the products you use (including prescription/nonprescription drugs and herbal products) and share it with your doctor and pharmacist. Do not start, stop, or change the dosage of any medicines without your doctor's approval. Some products that may interact with this drug include: antacids containing aluminum and/or magnesium, antivirals (e.g., acyclovir, ganciclovir, valganciclovir), azathioprine, calcium-free phosphate binders (e.g., aluminum products, lanthanum, sevelamer), cholestyramine, colestipol, live vaccines, natalizumab, rifampin. This medication may decrease the effectiveness of hormonal birth control such as pills, patch, or ring. This could cause pregnancy. If you are using hormonal birth control, you should use an additional non-hormonal form of birth control while using this medication. Discuss your options with your doctor or pharmacist. Also tell your doctor if you have any new spotting or breakthrough bleeding, because these may be signs that your birth control is not working well. NOTES: Do not share this medication with others. Laboratory and/or medical tests (e.g., blood counts, drug levels, kidney function, pregnancy test) should be performed periodically to monitor your progress or check for side effects. Consult your doctor for more details. Do not change brands or forms of mycophenolate unless directed by your doctor. Attend a transplant education class or support group. Learn to recognize the signs and symptoms of organ rejection. Seek immediate medical attention if they occur. If the capsule should come apart, avoid inhaling the powder, and avoid direct contact with the skin or mucus membranes. If contact should occur, wash thoroughly with soap and water; rinse eyes with plain water.